What better to add to your collection of contactless payment gloves and music beanie hats than a smart scarf? Microsoft Research has just presented exactly that at Stanford University's Conference on Tangible, Embedded and Embodied Interaction (TEI). 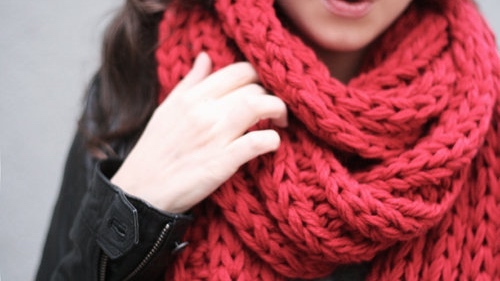 The smart scarf is still in the early stages but the current prototype both heats up on demand via a smartphone app and vibrates - we assume to alert the wearer to notifications and alarms. What's really clever is that the smart garment is modular so the heating and vibrating modules can be snapped off and switched around to best suit the wearer. It's made from hexagons of industrial felt and conductive copper taffeta in its current form making it flexible and metallic-looking. There's no images available of the prototype just yet according to MIT Technology Review who have seen the smart scarf in action. Right now the project, named Swarm (Sensing Whether Affect Requires Mediation), uses an app to allow the user to increase the heat provided by the scarf. In future versions, the research designers want to add cooling options to the controls and also work with biometric and stress measuring sensors to react automatically to changes in the wearer's temperature and mood. The scarf was initially designed for people with autism, mood disorders or visual/hearing disabilities. Instead of simply providing information and alerts, then, this smart scarf takes one of the core reasons we wear clothing in the first place (warmth, protection) and improves it with technology, no mean feat. We've seen something similar in the personal heating and cooling bracelet Wristify at Intel's Make It Wearable competition back in November 2014. The idea behind the smart bracelet is to both make the wearer more comfortable in a matter of seconds but also to save on huge energy bills in, for instance, offices. The MIT team behind Wristify also claim to be working on machine learning algorithms that will know what times of day the wearer most needs to cool down and get to work unprompted.